Good morning, folks! It’s another week, another dollar. But I’m happy it’s Monday (did I just say that? ), maybe because I had an awesome Sunday!! In any event, this past Saturday, my “auntie” Madeline and I went to go see “N-Secure”, starring Essence Atkins, Denise Boutte, Tempestt Bledsoe, Lamman Rucker, Nephew Tommy (from “The Steve Harvey Morning Show“, Elise Neal, and Cordell Moore. Madeline saw the info for the movie first, and after she showed me the trailer, I was hyped about going to see the movie. I truly believe in supporting black businesses and films, and this was a movie that was not made by Tyler Perry, so I was interested to see what it was all about. Most importantly, the movie dealt with a topic that is not talked about in the Black community as much as it should be-domestic violence. As usual, this review is going to tell some things that happened in the movie, so if you plan on seeing it, I suggest you stop reading now. In a nutshell, I really didn’t like this film. As one moviegoer behind me said, he “…would rather watch ‘Pootie Tang’…in Spanish.” The acting was pretty good, but the script was horrible. The parts that were supposed to be funny weren’t, there wasn’t enough development on story lines that I felt were important to the plot, and I wished they would have discovered ALL the dirty deeds David did. For instance, Denise Boutte’s character, Tina, was supposed to be a gold-digger, based on a reaction I saw from her cousin and the way she looked around David’s (Cordell Moore) house when she walked in. While the story sucked, it did show how some women will (realistically) stay with a man who is abusive, controlling, and selfish just so he will take care of them. It also shows how abusers will buy their girlfriends/wives gifts to appease them and to get their women to “obey” them and do as they wish. Thanks to Southern Mom, I found out that October is Domestic Violence Awareness Month, so in that sense I’m glad I saw this movie so I could bring domestice violence to your attention. I give the movie 2 out of 10 stars. If I were you, I wouldn’t knock down anybody’s doors to go see it. Maybe if it comes to the dollar movie in your city you may want to go. If you saw the movie, what did you think about it? If you know of anyone that is a victim of domestic violence or you think they’re a victim, encourage them to tell and get their abuser behind bars. When a person stays in an abusive relationship, it only gets worse. Unfortunately, the only way some women (and men) get out is by death. And we don’t want that to happen to anyone; these are tragedies that do not need to occur. Until next time, I’m just a Southern girl…in the city. Madeline here~ I must say that I wasn’t expecting too much from the movie but as we all should… wanted to support the Black film industry. In my opinion, the story had substance but lacked direction. There was drama along with some hokey comedy. The acting was too big for the movie. I was pleasantly surprised at “Vanessa” Tempest Bledsoe, she brought some real acting to this poorly directed film. This is definitley one of those movies that you would put in the dv/blue ray player on one of those cold rainy/snowy days. 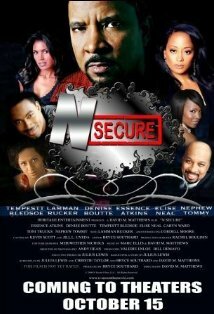 I will continue to support the Black film industry in hopes of seeing a blockbuster!!! Where are Bai Ling and Bokeem Woodbine? I demand that they be in all Black movies. This is an outrage! Really, Jabari?!? And who is Bai Ling?? ?